What is the ROI of Vancouver Real Estate? Forget gold, invest in Vancouver real estate. That was the message from the world’s biggest asset manager, Laurence D. Fink, back in 2015. His message was heard loud and clear; Vancouver prices have since soared roughly 30%. 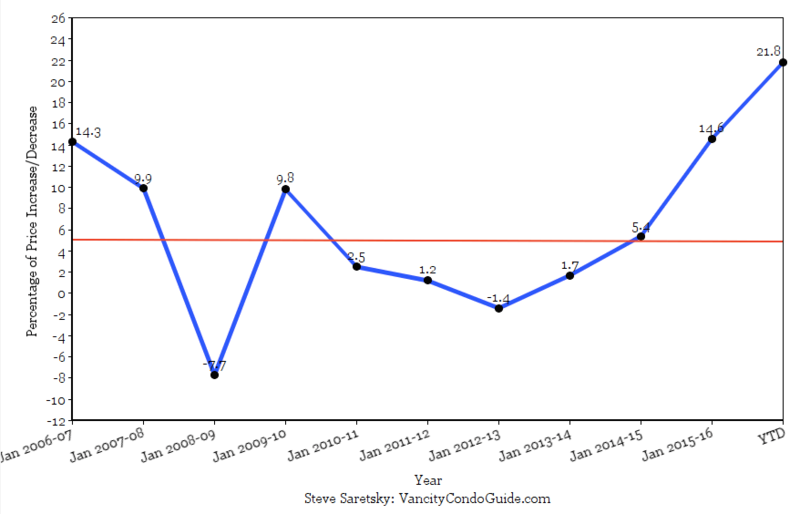 But despite an incredible last couple years, just how good is the ROI of Vancouver real estate? I decided to look back at the numbers over the past 10 years. (It’s as far back as the system would let me go). Using the Real Estate boards MLS Benchmark price for all of Metro Vancouver I was able to determine the average ROI each year for a detached house, townhouse, and condos. See below. Over the past 10 years (January 2006-January 2016) detached house prices have increased on average 8.7% each year. This number includes the recent 25.9% increase from January 2015-January 2016. However, it does not include the most recent 23.1% increase from January 2016- September 2016. The red line on the graph indicates the 8.7% average over the past 10 years. As you can see, the most recent price gains over the past 2 years are unprecedented. The typical ROI of a townhouse in Metro Vancouver has been 5% over the past 10 years. Again we have seen some incredible returns over the past 2 years. The most recently 21.8% increase so far in 2016 has not been included in the 10 year average. 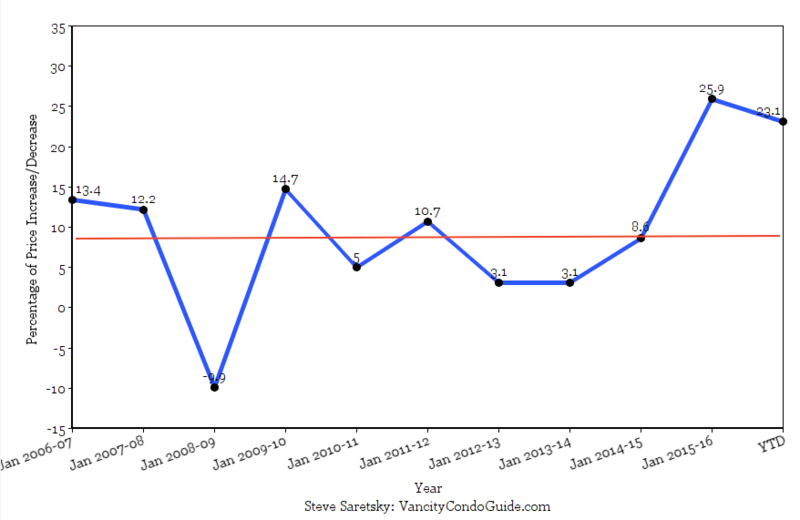 The average ROI for a condo in Metro Vancouver was 4.74% over the past 10 years. Not including this years 15.2% increase. 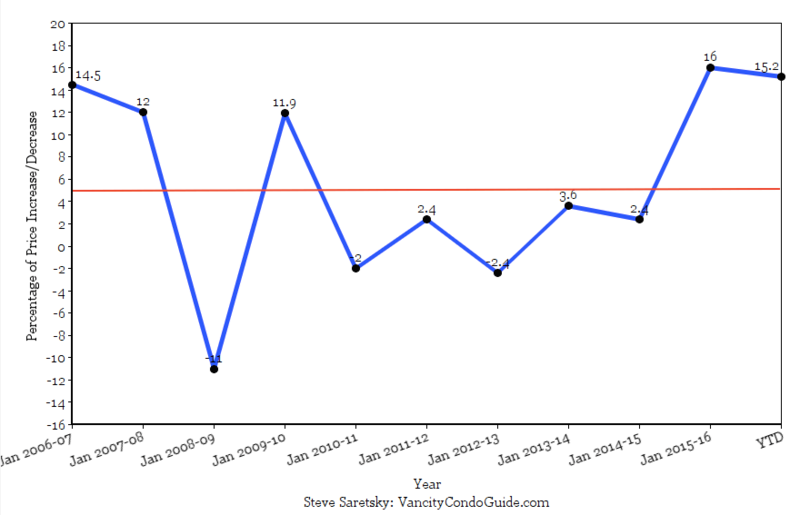 The past 10 years for Vancouver real estate have been very good. In fact, many would argue these kinds of returns are quite generous considering we somehow dodged the financial crisis with only a minor drop in prices. We also had the 2010 olympics which helped rebound the local economy and push prices back up. With ultra low interest rates and a number of other factors, prices have ballooned over the past couple years and clearly this kind of growth is unsustainable. With recent price growth surpassing more than 20% this year for both detached and townhouses, a correction should be expected. As I’ve mentioned in previous posts this is already happening. Although Vancouver will remain a strong investment in the long run, recent gains over the past two years of 49% detached market, 36.4% townhouse market and 31.2% in the condo market are unrealistic in the future. If you’re purchasing an investment property with hopes of this kind of appreciation you may want to think twice.